p53, also known as a tumour suppressor protein, is a gene that codes for a protein found in the nucleus of all cells in the body that helps regulate normal cell growth and multiplication. It is also plays a critical role in suppressing tumours by inhibiting the division and growth of cells whose DNA has been damaged. Over half of all cancers are caused by a missing or damaged p53 gene. Illustration of the relationship between DNA and the protein p53 by Thomas Splettstoesse. Source: Wikipedia. The p53 gene codes for a protein that is pivotal in the body's natural defence mechanism against cancer and in the suppression of tumour formation. All aspects of cancer such as its aggressiveness, response to treatment and its ability to spread to other sites in the body are related to the improper function of the p53 gene. As a result p53 is one of the most studied molecules within the biotechnology field. Some idea of its significance can be gauged by the fact that by 2010 p53 featured prominently in nearly 50,000 publications listed on PubMed. The discovery of p53 emerged out of studies on the monkey virus called simian virus 40 (SV40) known to cause cancer in mouse cells. Launched in the 1970s this work was directed towards understanding how tumour viruses transform normal cells into cancer cells. The protein's existence was first suggested in the mid-1970s by Peter Tegtmeyer and his colleagues based at the State University of New York. Based on some experiments with SV40 Tegtmeyer's team hypothesised that a viral protein could be triggering carcinogenic changes. Soon after this, in 1976, David Lane together with Lionel Crawford at the Imperial Cancer Research Fund launched research to see if they could find the proteins suspected of triggering the cancer changes associated with the virus. In March 1979 they published a paper in Nature that identified a new protein with a molecular weight of 53 kDa that appeared to act as a regulator of certain cellular functions related to growth control. Two months later Daniel Linzer and Arnold Levine, working at Princeton University, published independent observations in Cell about a protein similar to Lane and Crawford's that had a weight of 54 kDa. By August 1979 two more papers had been published by researchers at the National Cancer Institute and Institut de Researches Science in the Journal of Virology reporting the existence of another similar protein with a molecular weight of about 55 kDA. Further experiments carried out in 1979 by Lloyd Old and his team at the Memorial Sloan-Kettering Cancer Center in New York revealed that animals exposed to SV40 tumour cells directed an immune response to a protein weighing 53 kDA. Soon after, Crawford and his team found that 9% of human serum from breast cancer patients contained antibodies targeting a protein of the same weight. While scientists did not immediately recognise the link between the two findings, several years later it was recognised that each team had been looking at the same protein. In 1983 the protein was named p53 denoting its molecular weight. Initially p53 was assumed to be the product of an oncogene, a gene that causes cancer. By the late 1980s, however, scientists began to realise that p53 was instead a tumour suppressor that frequently mutated in human cancer. Over the following decade scientists began to uncover more information about the function of p53. This revealed p53 to be a molecule that was crucial to co-ordinating the complex cycle of a cell in times of DNA damage and other stress. The p53 protein itself is kept in check by MDM2, another protein that binds to p53 and destroys the molecule when there are too many in the cell. MDM2, however, is unable to attack mutated p53 and so cannot stop the build up of malfunctioning p53 proteins, the growth of which prevents the remaining healthy p53 from doing their work which is important to peventing tumour formation. In addition to its association with cancer, p53 has recently been found to have a much broader function. Recent work has shown p53 to play an important role in in female fertility, development, stem cell division and the process of ageing. 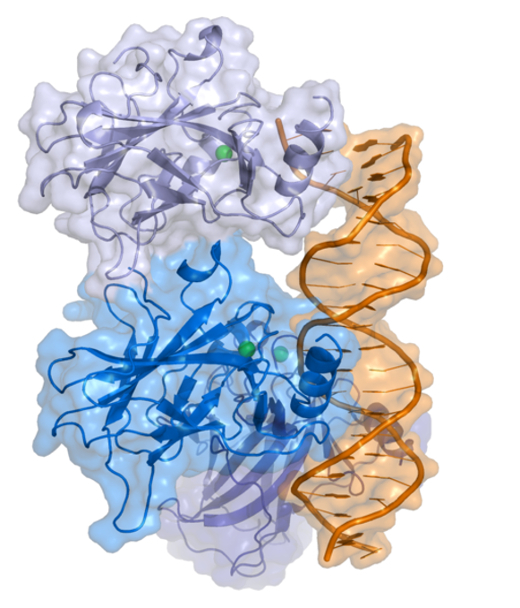 For many years p53 was assumed to be a unique protein. By 1997, however, two other proteins, p63 and p73, had been found which appeared to be related. Both these proteins play an important role in the development of skin, the nervous system and female reproduction, and can also act as tumour suppressors in certain situations. Moreover, it has been found that the gene that codes for p53, TP53, can produce nine different forms of the protein. Within industry and academia p53 is a key target for the development of therapy against cancer. By 2015 at least 114 companies were actively developing drugs targeting the p53 signalling pathway. Various approaches have been taken with p53, ranging from the use of p53 as a tumour suppressor through to p53-activating drugs designed to restore the function of defective p53 in tumours. Work has also been done on developing a therapy to block the action of MDM2, and its relative MDMX, to increase p53 levels. Overall the sucessful development of therapeutics has been slow. Part of the problem is that p53 is involved in so many cellular processes. Boosting its effect can, for example, cause unwanted side effects. In addition to therapy, blood screening techniques are being developed to detect any shedding of the protein before a fully-grown tumour has appeared. This is part of a strategy to rescue p53 so as to wipe out any cancer before it can get fully established.